Looking for a relaxing beach getaway close to Panama City? At ISTMO we provide luxury air-conditioned accommodations and healthy/international cuisine. Our Boutique Beach Hotel close to Panama City is set in an idyllic setting surrounded by nature. Come spend a couple of night on a luxurious beds, in one of our private bungalows. Our published room rates include daily housekeeping, multi-course breakfast for two and use of all facilities. And you can always count on daily on-site management to make you feel at home. Make a reservation with us. Make your stay in our Boutique Hotel a personal mini-retreat. With our wholesome meals, yoga classes and SUP tours you can tailor your own personal retreat during your stay in our Boutique Hotel. A delightful oasis of comfort and tranquility, truly unwind when you enter our stand-alone air-conditioned bungalow that blends seamlessly into the natural backdrop of the jungle that surrounds the property. Our Double Room comes equipped with two full-sized beds, outfitted with pillow-top orthopedic mattresses and luxurious linens for your ultimate comfort. 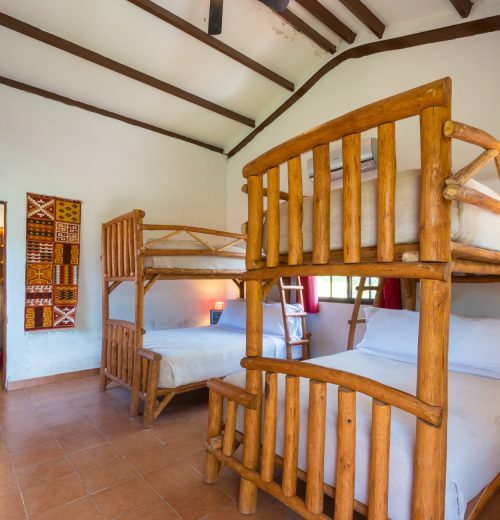 Each bungalow features balconies with seating and hammocks, air-conditioning, ceiling fans, mini-refrigerators with complimentary drinking water, and private bathrooms with hot water showers. Stay connected with free wireless in our centrally located hammock gazebo. Enjoy a healthy breakfast before beginning another day in paradise. Use Promo Code “YOGA” and get a free Yoga Class during your weekend stay! A spacious and inviting air-conditioned bungalow with plenty of comforts and amenities, unwind in this soothing oasis, nestled amongst trees offering a seamless natural backdrop. With two bunk beds, each offering a full bed below and twin bed on top, both outfitted with pillow-top orthopedic mattresses and luxurious linens, there’s room for the whole family or group in these stunning accommodations. 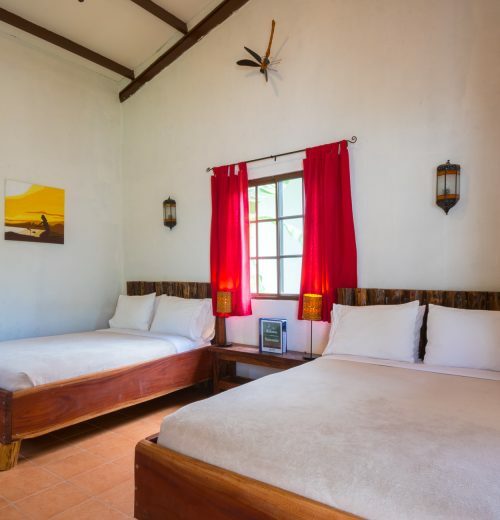 Each bungalow features balconies with seating and hammocks, air-conditioning, ceiling fans, mini-refrigerators with complimentary drinking water, and private bathrooms with hot water showers. Stay connected with free wireless in our centrally located hammock gazebo. Enjoy a healthy breakfast before beginning another day in paradise. Our room prices include – Healthy Breakfast, Complimentary parking, Complimentary tea, Daily housekeeping, Private bathrooms w/ hot-water showers, Luxurious linens, Complimentary drinking water, Mini-refrigerator, Ceiling fans, Air-conditioning, Pillow-top orthopedic mattresses, Balconies w/ seating & hammocks, and Wi-fi in central areas. For an additional charge, the restaurant on the premises serves drinks and a fixed-menu seafood or vegetarian dinner to our hotel guests. Include a Yoga Class, SUP Excursion and/or Massage, and make your boutique hotel stay a mini-retreat! If you book directly on our website, we include a complimentary diffuser with DoTerra oils for your use during your stay with us. We are a PET-FRIENDLY HOTEL. Please review our Policies.